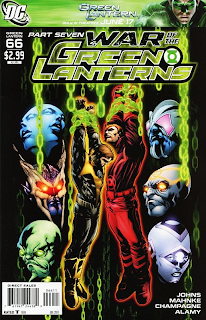 Having had all four Lanterns of Earth together in one place and fighting back against Krona’s dastardly plans, the writing team have now decided to split up the gang to tackle the problem from two different angles. 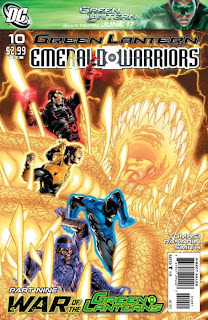 This means that Johns gets to steer Hal and Guy through the almost impossible task of fighting through the entity-possessed Guardians and breaking Parallax out of the Central Power Battery (people who don’t read these comics are probably really scratching their heads having read all of that!). This allows us to get a first proper glimpse at the possessed, emotionally charged Guardians using their new powers as they try to prevent Fear-enhanced Hal and Rage-fuelled Guy from completing their task. It’s this sort of action filled sequence that allows Mahnke to really show of his best work and once again he doesn’t disappoint in this regard with emotional constructs flying far and wide with vicious velocity. This issue in particular shows that these books wouldn’t be as effective without the talented skills of the various colourists involved and flicking through this particular issue shows just how magnificent a job Randy Mayor is doing at turning the precise lines of Mahnke and the inking team into a fully-formed comic spectacle with his bright and varied palettes. While Johns gets to look after the heroic antics of Hal and Guy, Tony Bedard gets to deal with John Stewart and Kyle Rayner’s side of the plan as they try to free the biggest Green Lantern of them all, Mogo the living planet, from Krona’s control and stop him from spreading power rings throughout the galaxy. 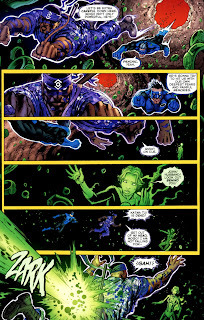 Here they not only come under attack from Mogo’s psychic defences but a possessed Green Lantern Corps and something lurking deep within the heart of Mogo himself. Compared to the previous chapter where the action spread out to various characters this remains focused on John and Kyle’s mission throughout and it might be said that this could be the most important chapter of the entire event when it’s all wrapped up. It’s unfortunate then to find my previous concerns with Bedard’s writing - especially his dialogue - and Kirkham’s art are still kicking around. Compared to the full and flowing writing styles of Johns and Tomasi which I really do enjoy, Bedard writes with a more direct, pointed and - dare I say it - ‘clunky’ style that still gets the job done and the story delivered but doesn’t stand up as well when laid next to the previously mentioned writers. That obviously wouldn’t be a problem in his own title but here he’s writing directly alongside those guys and I can’t help but think that it’s taking the sheen off of the series just a touch. 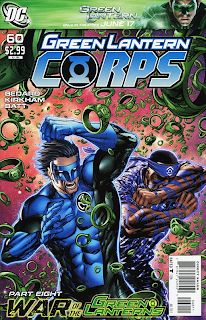 I have to say that I don’t think Kirkham is in the same league as Doug Mahnke and Fernando Pasarin, and his pencils, when combined with BATT’s heavy inking style, feel a little out of place here. ...because we get an extra page in this chapter ah-ha!! And to be honest, since I’m getting all three titles, I’d rather we had as many extra pages as we can get in Peter J. Tomasi and Fernando Pasarin’s instalment of War Of The Green Lanterns. As the fall out from Kyle and John’s mission swings the battle in a different direction, Tomasi delivers some weighty and emotional dialogue that shows that he has a perfect grip on how these characters should ‘sound’ and how they’ll react to certain events and situations. There’s an urgency to the writing and Pasarin’s clean style with its terrific use of viewing angles really gives things a greater feeling of scope than was offered in the previous chapter. 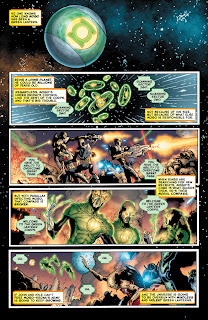 Tomasi seems to step on the gas pedal as the situation rapidly shifts from side to side with the Lanterns of Earth making a final push to defeat Krona and wrestle back control of the Green Lantern Corps. It’s this rising crescendo that enables Tomasi’s brilliant grasp of Guy Gardner to come through once more as the most rage-filled member of the Corps is forced to look deep within himself and the emotions that drive him on through his life. 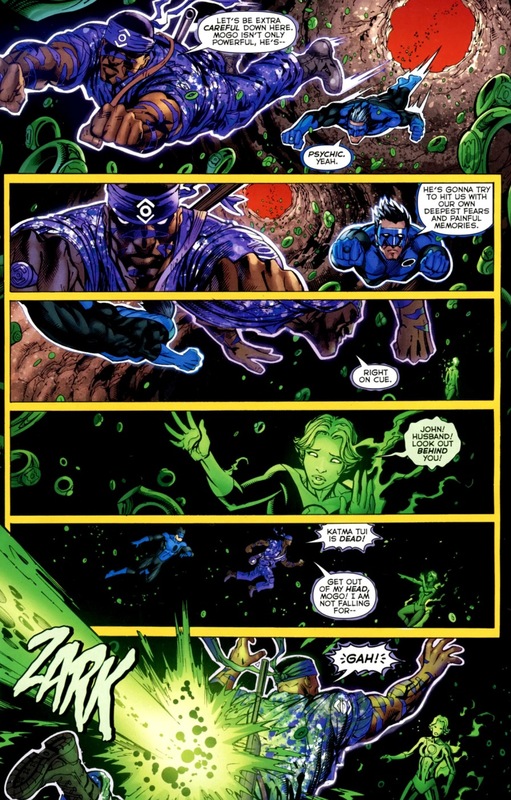 Just as we saw in the Green Lantern Corps: Blackest Night arc there’s a great sense of that Guy could almost explode at any moment and it’s that that helps to keep the story as unpredictable as possible. One thing I have noticed is that Pasarin keeps things on the small and contained side this time out, rarely utilising any sort of full-page splash which may be down to just how much story he needs to get through before leaving us with a mouthwatering conclusion that indicates we should be in for a veritable humdinger of a finale at the end of next month. Through this event it’s been the Emerald Warriors chapters that I think have stood out for me, which is interesting considering that ultimately this is Geoff Johns baby, but it’s testament to Johns and Tomasi’s complimentary styles and view of this Lantern Universe that this event has turned out as successful and as gripping a read as it is. As it stands this is a terrific penultimate chapter and deserves the 9/10 that I’m giving it.